The director of Khao Kheow Open Zoo in Chonburi has hit back at claims in the UK media and online that an "Elephant Playing in the Water" show amounts to animal abuse. Appaporn Sriheran told PPTV HD 36 that foreigners don't understand elephant behavior. He said his show is educational for tourists and students and he has no intention to stop it. Calls were made in the UK's mass circulation The Daily Mail for the show to end. A petition on Care2 responded to by animal lovers worldwide also called for the show to stop. PPTV said that activists want it stopped because mahouts are forcing the elephants to act unnaturally with enticements of food. The show, with "Pang Saeng Dao" the star of nine elephants who take part, has been going on two or three times daily for five years. Each show in the four meter deep tank lasts about ten to fifteen minutes. Hundreds of tourists and students view via an underwater viewing area 30 meters long. Mahouts (or elephant handlers) told PPTV that this is natural elephant behavior. The elephants breathe through their trunks and stand on their hind legs as they would do in the wild. 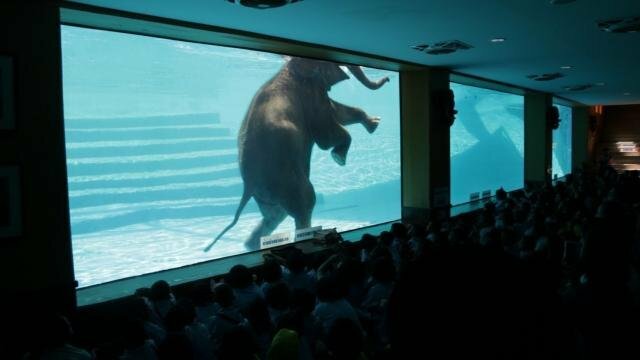 They said the elephants willingly enter the water for the show. Director Appaporn agreed saying that it was educational for tourists and students to learn about elephant behavior in water. The crowd get a great view of this in the area underwater, he said. He said that the practice of the mahouts riding on the neck of the elephants was ended two years ago and replaced by the handlers encouraging the elephants with promises of food around the edge of the tank. PPTV quoted him as saying that foreigners don't understand elephant behavior and he sees no reason to stop the show. Jeez man people should get a life, nothing wrong with this and of course it brings in money to feed the elephants which Im sure is a massive amount. Next we be saying the horse and pony wild west shows are cruel. Who cares about the Daily mail anyway isn't the website banned in Thailand? Another example of the ignorance and 'Thais know best' xenaphobic garbage that goes on here. Every elephant dreams of leaving Thailand and going to a superb western zoo where they have trained and highly qualified staff taking care of the animals. Theyre better off in a western zoo than taking their chances with these <deleted> who abuse them for commercial purposes ie tourism and logging. Mahouts (or elephant handlers) told PPTV that this is natural elephant behavior. i don't know,they are just doing to be different and make money. Elephants are excellent swimmers and often swim between islands. Surprisingly so are pigs and for the same reason, natural buoyancy. Unless the elephants get beaten or tortured, what is wrong with them having to swim for the food ? Before some beef-eater animal lover complains, there is still human slavery on the planet, just open your eyes. WOW - a First on Thaivisa somebody who knows what elephants are dreaming about!! If anything they better of in the wild and not an asian or western zoo. Chlorinated water must be bad for their skin. Just look at those wrinkles! Too many warriors these days. On many other topics I would usually agree. But these days I’m fed up to the back teeth with these <deleted> activists in the U.K.
One of the pluses of living in Thailand six months of the year for me is the near non existence of the far left progressive PC culture. Elephants know best. That their Thai handlers are a bunch of Wallies! Everyone needs a job. At least they are safe and well cared for and no one will shoot them for their tusks. Not perfect but not so bad. Well, thats just the thing, as a foreigner, I don't really understand if this is abuse or not. How would any Thais, including the animal trainer know either? None of us are elephants living at this zoo, so how would we know? I agree it doesn't seem that there is anything particularly bad about what we are being shown here, but that's just it, I have to trust that I am being presented with the full story. I am not there at the animal show or zoo or whatever it is and have never visited it either. What if an elephant were sick or tired, do you think he'd be given a day off? Somehow i doubt it. The show would just have to go on and he'd get psushed into the pool despite perhaps having a cold or congestion of his trunk so that he couldn't breath properly. I get the feeling the Thai public is just being shown select bits of this situation so as to create an opportunity to try and create some kind of a national feel good moment and thus improve ratings with a, "Ya see! We are criticized by these foreigners who just don't get it!" Its not about being wise and understanding elephants at all. Or could it be that because of many reports of temples and animal shows in Thailand clearly abusing animals that the rest of the world doesn't trust Thai animal handlers? I don't. Thai businesses and institutions are hardly any better with people either, regard for life or safety the whole nine yards, it doesn't matter, just abuse people and get your money and save face however it suits you, whatever it takes. Its routine. The word is out as well, so what is it that foreigners don't understand, oh PPTV? I think its clear who doesn't understand something here. If anything isn't understood, its that, at this point, the rest of the world has seen enough stories about Thai treatment of animals and human beings that you come away concluding from such reports that there is not one zoo, animal show or temple in the country that doesn't at least cut corners on providing for their animals, or neglect important aspects of care and safety or straight out mistreat the animals. You don't clear the record for Thailand either by presenting one case of being unfairly dissed in the foreign media either. Elephants in Zoos in the West are usually chained & very restricted as to movement. The Elephant farm at Mae Rim looks after these beasts of burden very well & they love a swim. These stirrers in the west got a better idea ?